When you stay at Noosa Blue Resort in Noosa Heads, you'll be near the beach, within a 15-minute walk of Noosa Beach and Hastings Street. 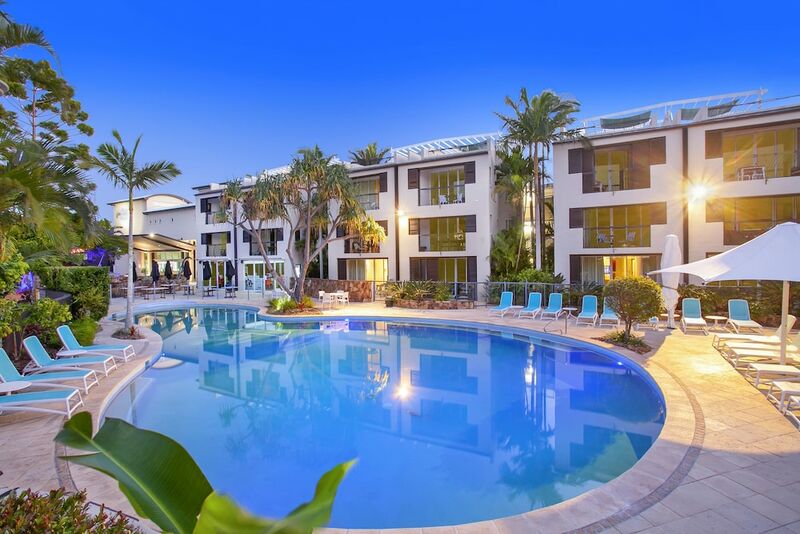 This 4.5-star apartment is 0.7 mi (1.2 km) from Noosa National Park and 9 mi (14.5 km) from Coolum Beach. Make yourself at home in one of the 62 individually decorated guestrooms, featuring kitchenettes with refrigerators and stovetops. Rooms have private furnished balconies. 40-inch flat-screen televisions with cable programming provide entertainment, while complimentary wireless Internet access keeps you connected. Conveniences include desks and microwaves, and housekeeping is provided on a limited basis. Dip into one of the 3 outdoor swimming pools or enjoy other recreational amenities including a waterslide and a steam room. Additional features at this apartment include complimentary wireless Internet access, wedding services, and tour/ticket assistance. Featured amenities include limo/town car service, express check-in, and express check-out. This apartment has 3 meeting rooms available for events. A roundtrip airport shuttle is provided for a surcharge (available 24 hours), and free self parking is available onsite. 24-hour airport shuttle service is available on request. Fees may apply. Contact the property in advance to make arrangements. Reception hours are 8 AM - 3 PM on Sunday. For more details, please contact the property using the information on the reservation confirmation received after booking. It's OK. Clean. Room design is a bit unusual. We had a spa stuck in our bedroom. Bathroom looks like a cupboard. Small fridge which was just adequate. Washing machine was annoying - wash dry cycle took 5 hours with damp results. Dry only cycle produced wet clothes. Not enough cupboards to put your stuff away. Puzzles cafe has what you need, locally roasted coffee is a perfect blend and will surely meet your caffeine desires. All the food is fresh and freshly prepared and the chefs are always happy to make a unique vegan/alternative option. All in all it looks, smells and tastes amazing. Enjoy your experience ? Its not a hotel. Its a service apartment. Good size. Has a heated pool, gym, massage. All in all it was very nice. We would definitely stay again.lastly the in room jacuzzi is great. Stayed an evening in room 109 at Noosa Blue Resort. Fantastic facilities, reception excellent and room was outstanding. Roomy, with excellent outdoor area and private BBQ. The bed was very comfortable. Under cover access to room which was very private however still close to both pools and all facilities. Excellent.